Public housing in the United Kingdom provided the majority of rented accommodation in the country until 2011. Houses built for public or social housing use are built by or for local authorities and known as council houses. Before 1865, housing for the poor was provided solely by the private sector. Council houses were built on council estates, where other amenities, like schools and shops, were often also provided. From the 1950s, blocks of flats and three- or four-storey blocks of maisonettes were widely built. Flats and houses were also built in mixed estates. Council homes were built to supply uncrowded, well-built homes on secure tenancies at reasonable rents to primarily working-class people. Public housing in the mid-20th century included many large suburban "council estates" and numerous urban developments featuring tower blocks. Many of these developments did not live up to the hopes of their supporters, and now suffer from urban blight. Since 1979, the role of council housing has changed. Housing stock has been sold under Right to Buy legislation, and new social housing has mainly been developed and managed by housing associations. A substantial part of the UK population still lives in council housing: in 2010, about 17% of UK households. Approximately 55% of the country's social housing stock is owned by local authorities – of which 15% is managed on a day-to-day basis by arms-length management organisations, rather than the authority, and 45% by housing associations. In Scotland, council estates are known as 'schemes'. The history of public housing is the history of the housing of the poor. Even that statement is controversial, as before 1890 the state was not involved in housing policy. Public housing became needed to provide "homes fit for heroes" in 1919, then to enable slum clearance. Standards were set to ensure high quality homes. Aneurin Bevan, a Labour politician, passionately believed that council houses should be provided for all, while the Conservative politician Harold Macmillan saw council housing "as a stepping stone to home ownership". The Labour government of Harold Wilson built houses and flats to the point where there was a surplus in the late 1960s. The Conservative government of Margaret Thatcher transferred the public housing stock to the private sector to the point where councils had to rent back their own houses to house the homeless, with the Right to Buy scheme being introduced in 1979 and the millionth council house being sold within seven years. Even in the stable medieval model of landowner and peasant, where the estate workers lived at the landowner whim in a tied cottage, the aged and infirm needed provision from their former employer, the church or the state. The documented history of social housing in Britain starts with almshouses, which were established from the 10th century, to provide a place of residence for "poor, old and distressed folk". The first recorded almshouse was founded in York by King Æthelstan; the oldest still in existence is the Hospital of St. Cross in Winchester, dating to circa 1133. The public workhouse was the final fallback solution for the destitute. Rural poverty had been greatly increased by the Inclosure Acts leaving many in need of assistance. This was divided into outside relief, or handouts to keep the family together, and inside relief, which meant submitting to the workhouse. The workhouse provided for two groups of people – the transient population roaming the country looking for seasonal work, and the long-term residents. The two were kept separate where possible. The long term residents included single elderly men incapable of further labour, and young women with their children—often women who had been abandoned by their husbands, single mothers and servant-girls who had been dismissed from residential positions. The pressure for decent housing was increased by overcrowding in the large cities during the Industrial Revolution of the 19th century; many social commentators (such as Octavia Hill) reported on the squalor, sickness and immorality that arose. Some industrialists and independent organisations provided housing in tenement blocks, while some philanthropist factory owners built entire villages for their workers, such as Saltaire (1853), Bournville (1879) and Port Sunlight (1888). The City of London Corporation built tenements in Farringdon Road in 1865, but this was an isolated instance. The first council to build housing as an integrated policy was Liverpool Corporation, starting with St Martin's Cottages in Ashfield Street, Vauxhall, completed in 1869. The Corporation then built Victoria Square Dwellings, opened by Home Secretary Sir Richard Cross in 1885. In 1912, Raymond Unwin published a pamphlet Nothing gained by Overcrowding. He worked on the influential Tudor Walters Report of 1918, which recommended housing in short terraces, spaced 70 feet (21 m) apart at a density of 12 per acre (30/ha). The First World War indirectly provided a new impetus, when the poor physical health and condition of many urban recruits to the army was noted with alarm. This led to a campaign under the slogan "Homes fit for heroes". In 1919, the Government first required councils to provide housing, built to the Tudor Walters standards, under the Housing, Town Planning, &c. Act 1919 (Addison Act), helping them to do so through the provision of subsidies. London County Council embraced these freedoms and planned eight 'cottage estates' in the peripheries of London: Becontree, St Helier, Downham for example; seven further followed including Bellingham. Houses were built on green field land on the peripheries of the urban area. The war had caused house building costs to rise enormously: Sir Ernest Simon reported to the Manchester Housing Committee in 1910 that "houses that had cost £250 to build pre war were then costing £1,250, so the economic rent was 30/- a week but had to be let at 12/6d". Whitefoot Lane (Downham) 49 n.a n.a. Source:* Yelling, J.A. (1995). "Banishing London's slums: The interwar cottage estates" (PDF). Transactions. London and Middlesex Archeological Society. 46: 167–173. Retrieved 19 December 2016. Quotes: Rubinstein, 1991, Just like the country. The Addison Act provided subsidies solely to local authorities and not to private builders. Many houses were built over the next few years in 'cottage estates'. The Housing, &c. Act 1923 (Chamberlain Act) of 1923 stopped subsidies going to council houses but extended the subsidies to private builders. Following the line of the railways, predominantly private estates were built on cheap agricultural land; building houses that the professional classes with an income of £300- £500 a year were able to afford. These pattern-book houses, put up speculatively by companies such as Wimpey, Costain, Laing and Taylor Woodrow, were mocked by Osbert Lancaster, as 'Mock Tudor' and 'By-pass variegated'. Large council estates following the line of the radial roads. This marked a further movement out of the city, first by the middle classes and then the blue-collar workers, leaving just the poorest layer of society living in the urban area. The first Labour government was returned in 1924. The Wheatley Act of 1924 restored subsidies to municipal housing but at a lower level, it failed to make any provision for lower paid, who were living in the worse conditions, and could not afford to pay the higher rents of the new houses, or travel to or from them to work. They continued in substandard housing circling the urban core; in Manchester, for example, this 'slum belt' was about one half miles broad. While new council housing had been built, little had been done to resolve the problem of inner-city slums, which could also be found in many smaller towns. This was to change with the Housing Act 1930 (Greenwood Act), which required councils to prepare slum clearance plans, and some progress was made before the Second World War intervened. During the Second World War almost four million British homes were destroyed or damaged, and afterwards there was a major boom in council house construction. The bomb damage from the war only worsened the condition of Britain's housing stock, which was in poor condition before its outbreak. Before the war many social housing projects, such as the Quarry Hill Flats (pictured, right) in Leeds were built. However the bomb damage meant that much greater progress had to be made with slum clearance projects. In cities like London, Coventry and Kingston upon Hull, which received particularly heavy bombing, the redevelopment schemes were often larger and more radical. While a number of large cities tentatively erected their first high-rise developments (e.g., Aston Cross in Birmingham, Churchill Gardens in Westminster), in England and Wales homes were typically semi-detached or in small terraces. A three-bedroom semi-detached council house was typically built on a square grid 21 feet (6.4 m) on the side, with a maximum density of houses of no more than 12 per acre (30/ha), that is to say around 337 square metres (403 sq yd) per house. As a result, most houses had generous space around them. The new towns and many existing towns had countless estates built to this basic model. In Scotland, the tradition of tenement living meant that most homes of this period were built in low-rise (3–4) storey blocks of flats. For many working-class people, this housing model provided their first experience of private indoor toilets, private bathrooms and hot running water, as well as gardens and electric lighting. For tenants in England and Wales it also usually provided the first experience of private garden space (usually front and rear). The quality of these houses, and in particular the existence of small gardens in England and Wales, compared very favourably with social housing being built on the European continent in this period. The 1951 Conservative government began to re-direct the building programme back from "general needs" towards "welfare accommodation for low income earners" The principal focus was on inner-city slum clearance, completing the job that was started in the 1930s. Harold Macmillan's task, as Minister for Housing, was to deliver 300,000 houses a year. These were 700 square feet (65 m2), 20% smaller than a Tudor Walters Bevan house, usually built as a two-bedroom terrace called "The Peoples House". From 1956, with the Housing Subsidy Act 1956 the government subsidy was confined to new houses built to replace those removed by slum clearance. There was more money available for blocks of more than six storeys high. Helped by this focused subsidy, neighbourhoods throughout the country were demolished and rebuilt as mixed estates with low and high-rise building. At the same time the rising influence of modernist architecture, the development of new cheaper construction techniques, such as system building (a form of prefabrication), and a growing desire by many towns and cities to retain population (and thus rental income and local rates) within their own boundaries (rather than "export" people to New Towns and "out of boundary" peripheral estates) led to this model being adopted; abandoned inner-city areas were demolished, and estates of high-rise apartments blocks proliferated on vacant sites. Whole working class communities were scattered, and the tenants either relocated themselves to neighbouring overcrowded properties or became isolated away from friends in flats and houses, on estates without infrastructure or a bus-route. Glasgow led the way and others followed. Tower blocks became the preferred model. The councils visited Marseille and saw the results of Charles Édouard Jenneret's (Le Corbusier's) vision. The argument was advanced that more generously sized dwellings could be provided this way, that communities could be re-housed close to existing employment opportunities and there would be far less disruption to local shopping and leisure patterns. During the 1950s and 1960s, the number of high-rise dwellings rose significantly. In 1953, just 23% of public-sector approvals were for flats, with only 3% high-rise (defined as blocks of six stories or more). By 1966, however, high-rise housing accounted for 26% of all homes started. A National Dwelling and Housing Survey carried out in 1977 also found higher levels of housing satisfaction amongst owner occupiers than council housing tenants. The survey found that 90% of owner occupiers were "satisfied" or "very satisfied" with their accommodation and only 4% "dissatisfied" or "very dissatisfied", while for council tenants the equivalent figures were 74% and 14%, respectively. Subsequent research at the London School of Economics has tried to cast doubt on claims that only high rise developments could accommodate the population density required for these policies. The post-war governments considered the provision of as much new housing as possible to be a major part of post-war policy, and provided subsidies for local authorities to build such housing. The Conservatives competed with Labour for the popular vote over who could build more houses, abandoning Bevan's principle that numbers weren't enough - that the homes had to be spacious and well built, too. The use of system building methods was later seen as possibly being a short-sighted, false economy, as many of the later houses are in a poor state of repair or have been demolished. On many estates, older council houses, with their largely superior build quality, have outlived them – more incredibly, they have even been outlasted by a large percentage of Edwardian and late Victorian private houses. "There was, however, one way in which slum clearance rather than enhancing housing standards actually threatened to reduce them: the building by experimented prefabricated methods, of large impersonal estates of high-rise buildings, lacking many of the amenities common in similar developments on the continent." Laws restricted councils' investment in housing, preventing them subsidising it from local taxes, but more importantly, council tenants were given the Right to Buy in the Housing Act 1980 offering a discount price on their council house. Proposed as policy by Prime Minister Margaret Thatcher and carried out under the remit of Secretary of State for the Environment Michael Heseltine, the Right To Buy scheme allowed tenants to buy their home with a discount of 33–50% off the market value, depending on the time they had lived there. Councils were prevented from reinvesting the proceeds of these sales in new housing, and the total available stock, particularly of more desirable homes, declined. The "right to buy" was popular with many former Labour voters and, although the Labour government of Tony Blair tightened the rules (reducing the maximum discount in areas of most housing need), it did not end the right-to-buy. Labour did relax the policy forbidding reinvestment of sales proceeds. Following its election in 2015, the Conservative government has announced proposals to extend the Right to Buy to housing association tenants. Social housing is being sold off under right to buy, new social housing is not being built to replace it and waiting lists for social housing have become very long, up to 18 years. Over a million people are on the social housing waiting list and a quarter of people on social housing waiting lists have been there for 5 years or more. The number of social homes is at a record low, over 100,000 households were on council waiting lists for over 10 years. Council houses sold under right to buy are typically sold at half market value, some of the money from the sale has to go to the treasury. Councils can replace only one in three of homes sold under right to buy. The Housing Acts of 1985 and 1988 facilitated the transfer of council housing to not-for-profit housing associations. The 1988 Act redefined housing associations as non-public bodies, permitting access to private finance, which was a strong motivation for transfer as public sector borrowing had been severely constrained. These housing associations were also the providers of most new public-sector housing. 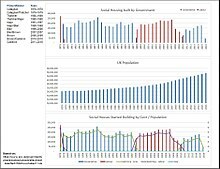 By 2003 36.5% of the social rented housing stock was held by housing associations. In some council areas referendums on changing ownership were won by opponents of government policy, preventing transfers to housing associations. The Wakefield district council found itself unable to maintain its supply of council housing and transferred it all to a housing association, in 2004; this represented the second largest stock transfer in British history. Housing rented from the council accounted for about 28% of the district and around 40% of the actual city of Wakefield. Many districts of the country have less than 10% of housing rented from the council; the national average stood at 14%. On 16 May 1968, the problems associated with tower blocks were brought into sharp focus after the partial collapse of Ronan Point, a system-built tower block in Newham, east London, as a consequence of a gas explosion. A similar incident caused significant damage to one side of a block in Manchester. Although these incidents were due to a series of failures (not least being the illegal connection of gas cookers by unqualified friends of tenants), subsequently all system-built tower blocks were usually built with "all electric" heating, to prevent the occurrence of such an explosion. The same year Manchester started the construction of the Hulme Crescents. Thirteen tower blocks connected by aerial walkways and the four long curving south facing blocks of flats and maisonettes connected by walkways and bridges. Five thousand homes were constructed in eight years. Three thousand of these were the deck access flats, almost immediately the constructional problems became apparent:they leaked, ducting failed and they were too expensive to heat. A child died falling from a deck and by 1975, and they were declared unsuitable for families with children, the elderly and the disabled. In 1975, 96.3% of the residents wanted to leave. 643 families petitioned to be rehoused. They were demolished between 1991 and 1994. While some tower blocks have been demolished, many that occupy convenient city centre sites (such as The Sentinels in Birmingham, Trellick Tower and Great Arthur House on the Golden Lane Estate in London) remain extremely popular with residents and have even been subject to an element of gentrification, caused by the onward sale of leases purchased by original tenants under the right to buy scheme to more affluent purchasers. 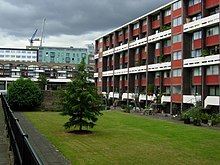 One of the most ambitious post-war council housing developments, the complex of estates at Broadwater Farm (shown above), became a national symbol of perceived failures in the council housing system following the Broadwater Farm riot in 1985. Since then, Broadwater Farm has been the focus of an intense regeneration programme, resulting in a dramatic drop in crime on the estate. In London many council estates are being demolished and replaced with luxury housing. Social housing is lost. Campaigners fear almost 8,000 homes could be lost overduring the decade following 2018. Among estates for regeneration, over 80 will be partly or completely demolished. The design and character of a council estate is related to the government initiative that allowed it to be built. The estates of the Addison Act are mixed tenure estates with generously proportioned semi-detached houses designed to be fit for heroes, albeit only affordable by the most prosperous workers. The generosity changed in the 1930s, with the push to eliminate the slums. Aneurin Bevan's, new towns and estates planned to the Tudor Walters standards were designed to be the pinnacle of housing to which all classes would aspire, while Harold Macmillan's "pile-em high, build-em cheap" philosophy reversed all this: firstly with his Peoples House, and then with Keith Joseph's system-build tower blocks. The earliest council estates were built within the borough boundaries on low value land that was walking distance from the places of employment. When that was exhausted, peripheral estates were built on the edge of the town. Residents needed to commute by public transport or bicycle, as almost none of the people living in these areas had cars until well after World War II. They bought vacant land in neighbouring boroughs to build overspill estates. In Greater Manchester, this included Wythenshawe in the 1920s and then Hattersley in the 1960s. Later, infill estates were created on small pieces of brown field land that had been vacated by contracting heavy industry. Some pit villages, such as Grimethorpe in Yorkshire, are almost entirely composed of original council housing. Leeds has Seacroft – the 'town within the city'. Sheffield boasts the award-winning Park Hill. Both Seacroft and Park Hill are now undergoing major redevelopment. 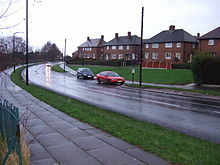 In Tyneside large council estates include Byker and Walker in Newcastle, Felling in Gateshead and Meadow Well in North Tyneside, the site of violent civil disorder in 1991. Meadow Well has been largely redeveloped since this unrest, with most of the old housing have been demolished. The very earliest council estates were in London, as they were permitted to finance houses ten years before non-metropolitan area and these were 'block estates' that is estates of tenement blocks, or in modern terminology estates of low or medium rise flats. The first was the Boundary Estate. The alternative was the 'cottage estate'[full citation needed] trialled at Totterdown Fields, which emulated garden city principles, though this was hampered until the 1906 Hampstead Garden Suburb Act and the 1910 Town Planning Act, removed some of the restrictions imposed by the 1875s byelaws. The Progress Estate, Well Hall Road, had an open spaced layout that gave a pleasant environment to residents. The Tudor Walters report was adopted and council estates opened up. They were designed to Radburn principles with wide feeder roads joining short cul-de-sacs. Houses were separated by at least 70 feet (21 m) from the facing houses. The former gridiron street pattern was deprecated. The Wheatley Act 1924, reduced the expected standard in a council built house. Under the Addison Act a house would be 1,000 square feet (93 m2) but after 1924 it would be 620 square feet (58 m2). Flats and bungalows were first built by local councils during the interwar years, but in relatively low volumes. Most interwar council houses were built on completely new estates. It was not until the 1950s that mixed estates of multi-storey flats and houses became a common sight, and until then it was rare to see blocks of flats that were more than three or four storeys high. An early and famous development of council flats was at Quarry Hill in Leeds. Modelled on Karl-Marx-Hof flats in Vienna, the complex was built by Leeds City Council. At the time they were considered revolutionary: each flat had a motorized rubbish chute leading to a central incinerator. The complex had its own offices, shops and gasworks. The 1970s sitcom Queenie's Castle was filmed there. Long-term problems with the steel-frame structure led to demolition, beginning in 1978 and there is now no evidence of their existence. 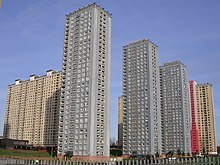 The Red Road flats in Glasgow were once the tallest residential buildings in Europe; but all eight towers were demolished in the 2010s. By the 1990s, many multi-storey flats and low-rise flats and maisonettes (mostly built in the 1950s and 1960s) were being demolished, due to their deteriorating condition, structural problems and a difficulty in finding new tenants when these properties became empty. One notable regeneration programme featuring tower blocks was that of the Castle Vale estate in Birmingham, built between 1964 and 1969 to rehouse families from inner city 'slums' in areas including Aston and Nechells. 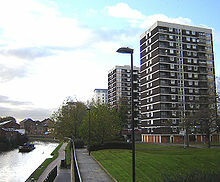 32 of the estate's 34 tower blocks were cleared between 1995 and 2004, with the remaining two being refurbished and re-opened as "vertical warden-controlled schemes". All of the estate's 27 maisonette blocks were also cleared, as were more than 100 bungalows. The remaining low-rise stock, however, was retained. The two remaining tower blocks were comprehensively refurbished. The sites of the demolished flats have been replaced by both private and social housing in low-rise redevelopments. The mood had changed and new council garden estates were built. These consist of low rise dwellings, mainly houses with gardens. The high residential density, equivalent to a tower block, is achieved by pedestrianisation of the estate, which allowed the dwellings to be very close together, separated by pathways not 11-metre (36 ft) -wide roads. The resident's car park is next to the service road. Front doors open onto pedestrian areas, which thus provide safe play areas for children. An early late 1960s example of this design is Cressingham Gardens. This estate popular with its residents, and they have resisted all attempts to be resettled. Becontree in Dagenham is the largest area of council housing in the UK with a population of over 100,000. It forms the bulk of a town. It was built during the 1920s and early 1930s. Otherwise, the largest estates are Wythenshawe in the south of Manchester and Bransholme in the north-east of Hull. In Scotland, Glasgow has the highest proportion of social housing. The largest estates include Drumchapel, Easterhouse, Castlemilk and Pollok. In Edinburgh there are several smaller peripheral estates such as Craigmillar, Wester Hailes and Sighthill. The large council estates in Wales include Caia Park in Wrexham, Bettws in Newport and Ely in Cardiff. The debate on public housing provision is politically polarised as can be seen in the large number of parliamentary acts referred to above. The left saw council estates as a great achievement while successive Conservative administrations attempted to curb their spread and restrict the essential funding for maintenance. In 1951, they changed the raison d'etre from being affordable homes for all, to homes only for the most needy thereby breaking up the social mix by grouping dysfunctional families together. With reference to housing layouts, the regeneration of large housing estates should incorporate measures such as diversification of tenure, the creation of smaller community areas, the provision of facilities for the young and proposals to create a more attractive environment, since it has been shown that packages of such measures are successful in reducing crime. Those who regard stable homes as a family's right see public housing differently from those who see it as welfare. They are comfortable that council housing was generally typified by unimaginatively designed houses with generously sized rooms[a] They could cope with aggravating estate rules that could forbid tenants "personalising" their houses, though this exercised journalists on the right-wing papers. The system favours those who have already secured tenancy, even when they are no longer in dire need. The combination of security of tenure and subsidized rent gives little incentive to tenants to downsize from family accommodation after their children have moved out. Meanwhile, those who are on the waiting list are often in much greater need of this welfare, yet they cannot have it; once a council house has been granted to a tenant, they cannot be evicted except for anti-social behaviour, serious offences committed at the premises. Recent policy decision to reduce the supply of public housing have exacerbated this problem. The Cameron government has addressed this shortage by imposing a bedroom tax to encourage movement. Social policy economists, such as Culyer and Barr, have been critical of the role that council housing plays in attempts to help the poor. One large criticism is that it hurts labour mobility with its system of allocating housing to those in the local area. Working-class people thus face a disincentive for moving across district lines, where they would be further down the waiting list for council housing in the new districts. The movement from a close urban society with multiple emotional and practical support mechanism to new out-of-town estates with few informal facilities has been recognised since the 1930s. Again when residence is restricted to the poor and dysfunctional the effect is greater. Council estates have been blamed for creating isolated community and mentality where residents have low aspirations. Councils are failing in their duty to rehouse victims of domestic violence. This can lead victims to return to the abuser. According to Jane Pritchard, housing lawyer, "The local authority simply needs 'reason to believe' that the person is homeless, that they're eligible for assistance under the Housing Act, and that they are in priority need of accommodation. Then there's a duty to provide suitable temporary accommodation immediately." Pritchard maintains she continually finds cases where Local Authorities have sent victims to another authority instead of rehousing them. Pritchard fears, "They may go back to the perpetrator and the abuse, and may never ever have the opportunity again of being rehoused." The legal status and management of council houses, and the social housing sector, has been subject to lobbying and change in recent years. Local authorities now have new legal powers to enable them to deal with anti-social behaviour and the misuse of council houses by organised gangs or anti-social tenants. An example is when a gang uses social housing as a "crack house". Anti-social behaviour orders (ASBOs) were created by the Crime and Disorder Act 1998, and ASBIs were created by amendments to the Housing Act 1996, enacted by the Anti-social Behaviour Act 2003. Tony Blair launched the Respect Agenda in 2005, aimed at instilling core values in the tenants of council houses. Recently bodies such as the Social Housing Law Association have been formed to discuss the impact of legislation in the social housing sector and to provide training and lobbying facilities for those who work in that area. (b) Including maisonettes, which are not shown separately from 1967. 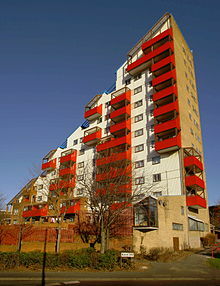 Different British Governments oversaw the vision, regulations and overall budget for social housing. In 2011 almost 40,000 English socially rented homes were built. Just 5,900 social housing homes were completed in 2017 which is the smallest proportion of overall housing building since records began. Government funding for social housing in 2018 is widely considered insiufficient. London and some other local authorities are moving people out, away from their work and their social networks due to lack of available social housing. In 2018 it is promised that the government will build just 2,500 social homes per year. Most newly built homes will be too expensive for the poorest people. ^ council housing was generally typified by unimaginatively designed houses with generously sized rooms when compared to houses at the bottom end of the private sector, particularly those built in the 1970s after the Parker Morris standards were introduced. ^ a b Hollow 2011. ^ UWE 2008, Section 3 para. 1. ^ Hanley 2012, p. 60. ^ Hanley 2012, p. 92. ^ Hanley 2012, pp. 134,135. ^ a b de Pennington 2011. ^ a b UWE 2008, Section 7 para. 3. ^ a b UWE 2008. ^ "St Martin's Cottages municipal housing, Silvester Street, Liverpool". RIBApix. ^ "Victoria Square municipal housing, Liverpool, prior to conversion". RIBApix. ^ "Housing of The Working Classes Act, 1890". Government of Ireland. 1890. Retrieved 24 December 2015. ^ Yelling 1995, p. 167. ^ UWE 2008, Section 2..
^ Burnett 1986, p. 184. ^ Parkinson-Bailey 2000, p. 153. ^ a b UK Parliament- Acts 2015. ^ Parkinson-Bailey 2000, p. 154. ^ a b c Parkinson-Bailey 2000, p. 155. ^ "United Kingdom" Section VII (History), J (World War II and Its Aftermath), J2 (Postwar Britain), MSN Encarta Online Encyclopedia, 2006. Archived 31 October 2009. ^ UK Parliament-New Towns 2015. ^ Panagidis & Savva 2015. ^ Hanley 2012, pp. 88-93. ^ Hanley 2012, p. 93. ^ a b UWE 2008, Section 6..
^ Hanley 2012, pp. 68, 69, 71. ^ Hanley 2012, p. 103. ^ The Five Giants: A Biography of the Welfare State by Nicholas Timmins. ^ R. Burdett, T. Travers, D. Czischke, P. Rode and B. Moser, Density and Urban Neighbourhoods in London: Summary Report (Enterprise LSE Cities, 2004), pp. 13–14. ^ Meek 2014, page 3..
^ Glendenning, Miles, and Muthesius, Stefan (1994), Tower Block: Modern Public Housing in England, Scotland, Wales, and Northern Ireland. ^ Meek 2014, page 3. ^ Hanley 2012, p. 29. ^ "History of Chelmsley Wood". Metropolitan Borough of Solihull. Retrieved 14 January 2016. ^ "1979: Council tenants will have 'right to buy'". BBC News. 20 December 1979. ^ a b Wheeler, Brian (14 April 2015). "A history of social housing". BBC News. Retrieved 25 January 2019. ^ Murie, Alan (11 November 2015). "The Right to Buy: History and Prospect". History & Policy. Retrieved 5 July 2016. ^ Hal Pawson, Cathy Fancie (10 September 2003). The evolution of stock transfer housing associations (Report). Joseph Rowntree Foundation. ISBN 1 86134 545 3. Retrieved 3 March 2017. ^ a b Meek 2014. ^ Parkinson-Bailey 2000, pp. 194–195. ^ "20 years later at Broadwater Farm". Christian Wolmar. ^ Hanley 2012, p. 94. ^ Hanley 2012, p. 95. ^ Cox 1995, p. 160. ^ UWE 2008, Section 3..
^ a b UWE 2008, Section 4..
^ "Leeds - In Pictures Quarry Hill's history". BBC. ^ Mornement, Adam (March 2005). "Chapter 1: The Rise and Fall of Castle Vale, 1964–1993". No Longer Notorious: The Revival of Castle Vale, 1993–2005 (pdf). Castle Vale Neighbourhood Partnership. pp. 4–15. ^ "A time for trust at Lambeth's Cressingham Gardens estate". The Guardian. 8 March 2015. ^ a b c d e Hanley 2012. ^ "'Problem' people, 'problemg places? New Labour and council estates". University Press Scholarship. ^ "Community understanding". The University of Nottingham. ^ a b "'Problem' populations, 'problem' places". OpenLearn. ^ "Planning and crime prevention". Archived from the original on 8 September 2014. Retrieved 8 September 2014. ^ "Social Housing Law Association". ^ "Table 211: permanent dwellings started and completed, by tenure, United Kingdom (quarterly)". Office of National Statistics. 25 May 2017. Retrieved 23 July 2017. ^ "Population estimates time series dataset". Office of National Statistics. 22 June 2017. Retrieved 23 July 2017. "History of Council Housing". University of the West of England. 2008. Retrieved 3 December 2015. Parkinson-Bailey, John J. (2000). Manchester: an Architectural History. Manchester: Manchester University Press. ISBN 0-7190-5606-3. Burnett, John (1986). A social history of housing : 1815–1985 (2nd e. ed.). New York: Methuen. ISBN 0416367801. Calow, Dennis (2007). Home Sweet Home: A century of Leicester housing 1814–1914. Leicester: University of Leicester:Special collections online. Retrieved 7 October 2015. Gimson, Andrew. "How Macmillan built 300,000 houses a year". Conservative Home. Hanley, Lynsey (2012). Estates : an intimate history (New ed.). Granta: Granta. ISBN 9781847087027. Hollow, Matthew (2011). "Suburban Ideals on England's Interwar Council Estates". Retrieved 29 December 2012. Meek, James (2014). "Where shall we live". London Review of Books. 36 (1): 7–16. Panagidis; Savva (2015). "Entry #411:Southwyck Open House". Designing the Urban Common. Theatrum Mundi. Retrieved 7 December 2015. "Case Studies - Progress Estate". Ideal Homes. Retrieved 1 October 2015.
de Pennington, Joanne (2011). "Beneath the Surface: A Country of Two Nations". BBC History. Retrieved 9 December 2015. "Council Housing". Living Heritage-Improving towns. UK Parliament. Retrieved 9 December 2015. Rubinstein, Antonia; Andrews, Andy; Schweitzer, Pam (1991). "Just like the country" (PDF). Age Exchange. Retrieved 17 December 2016. Rubinstein, Antonia; Andrews, Andy; Schweitzer, Pam (1991). "Just like the country part 2" (PDF). Age Exchange. Retrieved 17 December 2016. "New Towns". Living Heritage-Improving towns. UK Parliament. Retrieved 9 December 2015. Allen, Chris (2009). "Anti-Social Housing: 'Right to Buy' and Thatcher's Legacy". Walls come tumbling down. The Institute of Applied Social Sciences University of Birmingham. Retrieved 9 December 2015. Press Release (2005). "Wakefield housing initiative England's largest". Walker Morris. Archived from the original on 11 December 2015. Retrieved 9 December 2015. Yelling, J.A. (1995). "Banishing London's slums: The interwar cottage estates" (PDF). Transactions. London and Middlesex Archeological Society. 46: 167–173. Retrieved 19 December 2016. English Housing Survey : HOUSEHOLDS Annual report on England's households, 2013-4 (PDF) (Revised September 2015 ed.). Department for Communities and Local Government. 14 July 2015. ISBN 9781409846420. Retrieved 4 January 2016.